I haven’t driven a BMW for a while and I relished the chance to drive the new X2. I was surprised to learn Mercedes have beaten BMW to be the Global Premium Brand. This has been BMW’s title for quite a while now, but they are fighting back yet an onslaught of new cars. The X range of cars now accounts for one in three worldwide sales so it’s a very important new launch. The X2 sits between the X1 and the X3, it’s firmly aimed at the Evoque which has been a massive sales success for Land Rover and I’m amazed it’s taken BMW so long to launch a worthy competitor. The X2 is longer, sleeker and sportier than the X1 but it is slightly less roomy in comparison. The car will appeal to people who don’t mind compromising on space and that are looking for something sporty. Despite the current backlash against Diesel engines there are two diesels and one petrol engine to choose from. I drove the 2lt diesel which is expected to be the best seller in the range. It gets to 62mph in under 8 seconds but its trump card is potentially 60mpg in the right hands. The petrol engines figures are nigh on the same but fuel economy isn’t quite as good as the diesels. Once you start the car most of the noise from the engine doesn’t make its way into the cabin, at motorway speeds there is very little noise at all. The MINI Countryman and the X2 share the same platform, rest assured they drive totally differently though, partly thanks to the cars having different springs, dampers, roll bars, bushes and different steering racks. With its M Sport makeover and fitted with the beautiful 20″ alloys I have to say the car felt quite harsh and choppy on most surfaces. I personally think that’s down to our terrible roads and the low profile tyres didn’t help at all. The car is very beautiful with creases and styling cues all over the place, the designers’ new name for this is precision with poetry. The badges at the rear quarters just remind me of the CSL which looked a bit like the bat-mobile. They have given the front a new updated look with wider kidney grills which give the car quite a menacing look, especially when you see the car in your rear view mirror. There are four trims to choose from, SE, Sport, M Sport and M Sport X, the M Sport get a makeover from the M division, the car is lowered by 10mm lower and it’s given a sporty body kit so it’s got loads of kerb appeal, I have to admit to not liking the plastic on the sides of the car or underneath the bumpers. I know the car is aimed at young funky people so I suppose I’m showing my age but it looked a bit cheap if I’m being honest. As with all BMW’s the interior is a very nice place to spend time, from the chunky three spoke steering wheel to the really nice mood lighting in the car it really oozes quality. The car I drove had leather interior but the one of the cars in the showroom had a rather funky interior trim, it was a mix of suede and fabric which may not sound very appealing but I personally think it really suited the car. It had very cool yellow stitching and it really reminded me of a 911 GTS with the optional alcantara interior. I really loved the dash with its normal dials rather than the electric dashes most companies are going for at the moment. All the switches and buttons have a real quality feel as does the dash. There was plenty of storage space for all the clutter I need on a daily basis. The reverse camera is handy as the rear window is quite small so reversing isn’t that easy. Another thing I noticed while driving in the dark, when I reversed the car into the restaurant car park the passenger side mirror dips and the mood lighting on the dash makes it really hard to see the mirror due to the reflection from the very nice mood lighting. I hope that makes sense but if you do buy one you’ll know what I mean! The X2 is priced from £33,000 to £38,000 for the X Sport. Beware, as with all German cars the option list is not only extensive but it also has some very expensive bits like head up display, wireless phone charging, Wi-Fi and hands free parking. After driving this car for a few days I can honestly say it’s a very stylish, practical and very economical car indeed. 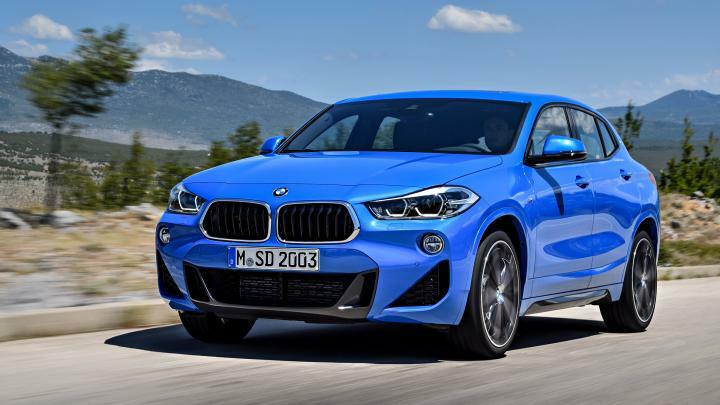 I can’t wait to drive the new Z4, 8 series and M5 and at some point they’ll be launching the new X7 so I’m sure they’ll be regaining the Global Premium Brand Crown again very soon.